The home painting professionals at Quality Residential Painting, Inc. in the Carmichael, California, do good, honest work for an honest day's pay. We take pride in providing our customers with a quality paint job that you are sure to brag to friends about. We do not take shortcuts, and are very meticulous in every detail. No job is finished until you are completely satisfied. Our team works 8:00 a.m. to 5:00 p.m., five days a week. We stay on the job until it is finished. If we start a job, we finish the whole project before starting a new one. A walkthrough is always performed before we begin to see the project space. We do not offer pricing over the phone but prefer to meet you in person. Each customer's home is treated like our very own. Thanks to the quality of our work, you are sure to call us year after year. People change house colors all the time and move around, so we make sure that the exceptional quality always remains the same–if not better! If you check with our past clients and customers, you'll find that they'll tell you we do a phenomenal job and you would be making a mistake to have anyone else providing you with painting services. Real estate companies also turn to us for interior and exterior painting services. Clients like that fact that we are always on time. We make sure to be there when you schedule us, and never show up late. We do not like tardiness and you can set your clock with us. If we have to stay late to finish a job, we stay late and that's that. 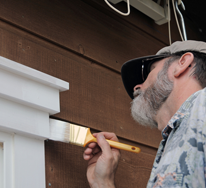 Contact us at (916) 765-8731 in Carmichael, California, to learn more about our home painting contractors.